Phil is a graduate of East Richland High School in Olney, IL. Playing under Newburgh, IN native Andy Julian, Britton lettered 3 of his 4 years at East Richland High school, setting a single season home run record his senior year with 12. After graduating in 2003, Britton attended Olney Central Community College as a catcher under NJCAA Hall Of Fame coach Dennis Conley where he led all of NJCAA in RBI’s with 89. Was 29th with a batting average of .426 and 10th in homeruns with 15. Britton was drafted by the Atlanta Braves in the 36th round in 2004, was named GRAC freshman of the year, and earned Second team NJCAA All-America honors. Following his 2004 freshman season, in the fall of ‘04, Britton signed a national letter of intent to play at the University of Kentucky. Britton finished his sophomore year at OCC 30th in NJCAA in batting average hitting .430 and 50th in homeruns with 10, earning First Team NJCAA honors. All- Region 24 team honors and All-Region tournament team honors followed both 2004 and 2005 seasons. 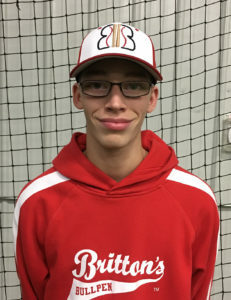 After completing two years of JUCO baseball at Olney Central College, Britton elected to decline the offer the play at the University of Kentucky, and join the Atlanta Braves Organization. Phil was a member of the Atlanta Braves organization from 2005 -2009, playing in the Gulf coast league(R), Appalachian league (short season A), South Atlantic League (-A), Hawaii Winter Baseball League (Major league Prospects league), Carolina League (+A), Grapefruit League (MLB) Southern League (AA) Eastern League (AA) International League (AAA) with the majority of his time being spent at the AA level. In 2010, he spent the year with the Baltimore Orioles organization where he played at the A, AA, and AAA levels. 2011 was his last year playing professional baseball, spending the first half of the season playing in the American Association with the Fargo-Moorhead Red hawks, and finishing his career with Manager Andy McCauley and the Evansville Otters of the Frontier League. Following his playing career, Phil began coaching with the 2016 Frontier League Champion Evansville Otters, and in 2012 opened Britton’s Bullpen Inc., a baseball/softball training facility in his hometown of Olney, IL. Britton’s Bullpen is the indoor training facility to the OCC Baseball and Softball teams, as well as local youth baseball and softball teams. Phil now focuses on instructing baseball and softball, and manages youth baseball traveling teams, working to help amateur players and parents not only showcase their ability, but also help them understand the processes of what it takes to advance in the game.